In this, her fifth collection, Janice Fitzpatrick Simmons continues to record the journey of a rich and passionate life. Moving on from the earlier poems of migration and love and loss she now concerns herself with survival, rebirth, the tentative rediscovery of love in all its doubts and certainties. Rich in its evocation of different land- and sea-scapes, this poetry of pilgrimage and of physicality celebrates the Atlantic coasts of Donegal, the estuaries of the South East, the slow canals of the midlands, the agelessness of tradition in Brittany. Fitzpatrick Simmons achieves a rare blend of American desire to achieve form with the more Irish expression of the liberating potential of imagination and music. A collection to savour - often. Janice Fitzpatrick Simmons took an MA from the University of New Hampshire. Her four collections of poetry have been reviewed in the USA, Ireland and Great Britain. Widely published in literary journals in Ireland, England and America, Janice's work has appeared in major anthologies such as A Rage for Order, The Backyards of Heaven, The Blackbird's Nest, Salmon: A Journey in Poetry 1981-2007 and Irish American Poets since 1800. After a period as assistant director of the Frost Place in New Hampshire, Janice founded the Poets' House in Portmuck in 1990, moved it to Falcarragh in 1996 and relocated its teaching function to Waterford in September 2005. The Poets' House was the first cultural and educational institution in Ireland to offer an MA in creative writing. and salmon find their way up the Ray. brings in the lengthening evenings of my absolute solitude. 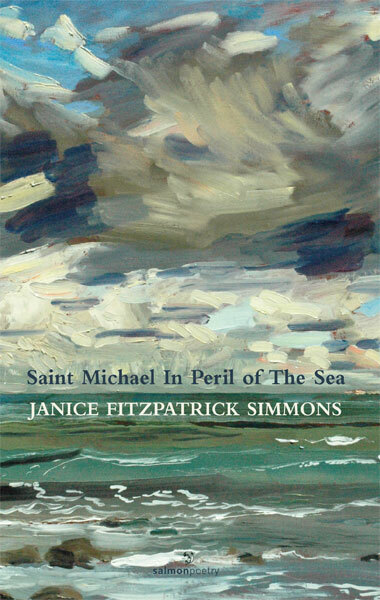 Salmon Poetry have just published the new Janice Fitzpatrick Simmons book of poetry, Saint Michael in Peril of the Sea and there is a sad and painful clarity within its pages as the poet laments and mourns (not only) the tragic loss of her soul mate and lover, the late great Northern poet, James Simmons. Within the several metaphors in the book there is the struggle to keep alive not only the memory but the actual books and inspiration of The Poets' House that Janice Fitzpatrick, an American poet, founded with her late partner, James Simmons in 1990 in Antrim. The House was a beacon in the perilous sea of poetry in life and in Northern Ireland and it had significant success with the list of guest tutor/poets including Heaney, Ni Domhnaill, Longley, Montague, Meehan and Dorgan, with a fine list of Americans like Billy Collins, Tess Gallagher and Richard Tillinghast. After the death of James Simmons, Janice struggled to keep this place as well as the ideal going and moved to Waterford in September 2005 to run similar creative writing programmes at IT. Her book is part of her struggle to grieve and to keep alive the achievements of The Poets' House in some stormy seas of promises and disappointments. The title poem is set in Brittany, where the Island of Saint Michel is a remnant of the mainland and the Saint Michael is the Archangel image of the great prince who stood up for children, a protector in battle against the wickedness and snares of the devil. In Peril of the Sea is another metaphor, no doubt, from the poet's childhood, when the Hymn, Eternal Father, Strong And Brave, was and is the Navy Hymn of the US Navy, with its evocative chorus line In Peril of the Sea. This book is laid out in three sections dedicated to all the students of The Poet's House, past and present - Penelope On The Suitors, The Royal Canal and the title sequence. Penelope is the Greek Queen who took Ulysses as a husband before he voyaged off to the Trojan war. During that long absence, the Queen was urged to take another suitor to keep the kingdom and its ideals alive but out of this myth we get the story of Penelope's web of decision, a robe, that when finished, she would eventually remarry. This web is now a literary metaphor for anything which is perpetually doing but never done. But I must stress that this book is in no way academic or dense. The emotions cry out, the torment is real, the hopes for new love and continuity is very very real. The understated wish that the suitors in question could be the people who came to The Poets' House and who could now restore it and perpetuate its dream. In the palm of my hand." This is a book to cherish and read and in doing so you will continue a love story, perhaps a new love story and keep alive the dream and reality of a poet's house and a poet's heart.